It’s been nearly two years since Apple updated the iMac, which may not seem like such a big deal, especially for a desktop computer. So, understandably, if you bought an iMac in the past three or four years, maybe you aren’t looking for a new computer right now. But if your Mac is older than that, you’re probably looking to upgrade, and it’s hard to convince yourself to invest in a computer that was released so long ago. Apple has finally updated the iMac, so if you’re in the market for a new computer, now’s the time to do some shopping. In this review, I take a close look at the high-end 21.5-inch iMac with a 3.4GHz Core i5 Kaby Lake processor, which sells for $1,499. The 2015 21.5-inch iMacs had Intel’s fifth-generation Core processor, code-named Broadwell. The 2015 27-inch iMacs had Intel’s sixth-generation Skylake processors. The new 2017 iMacs have Intel’s seventh-generation processor, called Kaby Lake. The 21.5-inch Macs have dual-core Core i5 Kaby Lake processors, while the 27-inch iMacs have quad-core Core i5s. (Apple offers customization options to a Core i7 processor in some models.) The processor in our $1,499 iMac review unit is clocked at 3.4GHz, and it has Turbo Boost up to 3.8GHz. The 21.5-inch iMac stands 17.7 inches tall with a width of 20.8 inches. The stand depth is 6.9 inches. Apple also improved the graphics hardware. The $1,499 iMac in this review has a 4GB Radeon Pro 560, and all of the new iMacs except for the $1,099 entry-level model now use Radeon Pro graphics. The 2015 21.5-inch iMacs used Intel Iris Pro Graphics 6200, while the older 27-inch models used older Radeon cards. The new $1,099 iMac uses Intel Iris Plus Graphics 640. All new iMacs come with 8GB of memory, and you can add more RAM when you order your iMac, which also increases the overall price. With previous 21.5-inch Macs, it was a good idea to add more RAM when you bought the iMac, because there was no way to install an upgrade. Apple has changed its tune for these iMacs; more RAM can be added later, but you need to bring the iMac into an Apple store and have them install the RAM. The 27-inch iMacs have user-upgradeable RAM. To gauge the performance of the $1,499 iMac, we ran benchmarks from Geekbench 4. We then compared the results to older iMacs, including the Retina and non-Retina 21.5-inch iMacs from 2015, a 1.6GHz Core i5 (Haswell) iMac from 2014, and a 2.9GHz Core i5 (Haswell) iMac from 2013. 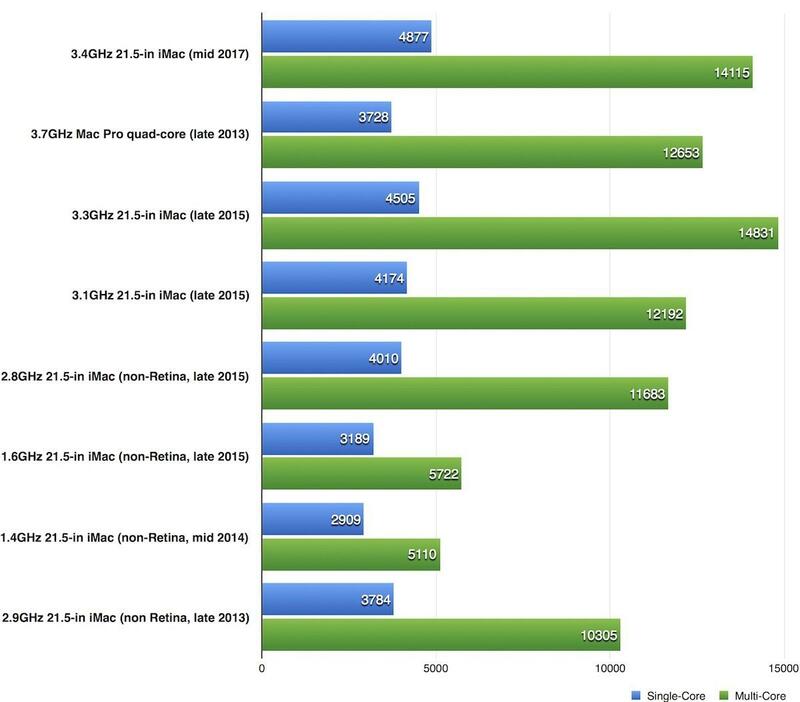 We also included benchmarks from a 2013 3.7GHz quad-core Mac Pro, for your reference. Compared to the 2015 3.3GHz iMac, the new 3.4GHz model is about 8 percent faster in single-core performance, which involves tasks like using productivity software and web browsing. With multi-core performance—which is of interest by users of pro apps—we found that the performance between the two iMacs is virtually the same. Before you think that’s disappointing, we need to take into consideration what’s coming in the fall from Apple: macOS High Sierra. There’s a potential for better gains when Apple’s new Mac operating system is released. I’ll elaborate in a bit. The difference with other 2015 iMacs is more impressive, ranging from 17 to 53 percent in the single-core tests and from 16 to 147 percent in the multi-core tests. As I mentioned, there is potential for even bigger gains with macOS High Sierra—specifically when working with video. One of the features of macOS High Sierra is support for High Efficiency Video Coding (also know as H.265), a new video standard. And Kaby Lake processors have support for accelerating HEVC performance. So if you combine the two—High Sierra HEVC support and Kaby Lake HEVC optimization—that should equal better video performance. 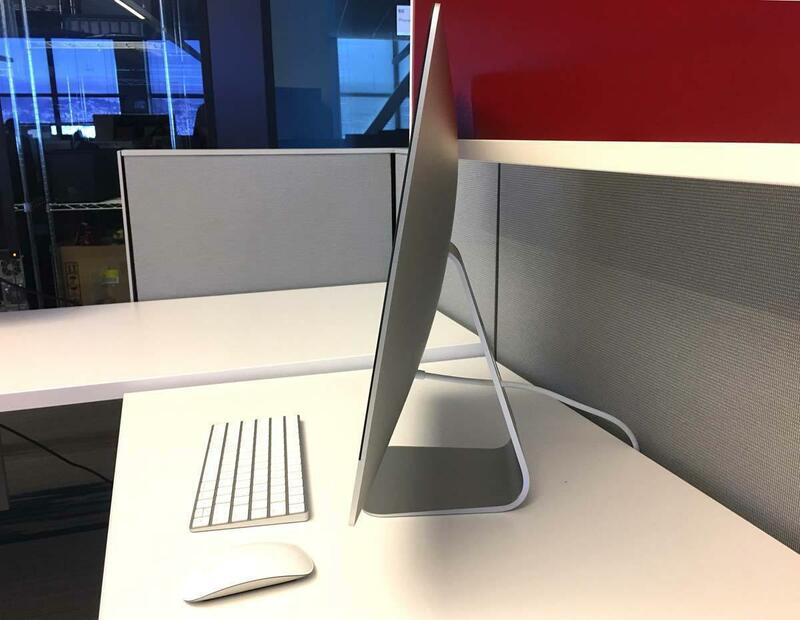 Apple updated the iMac screen with one that the company says is 43 percent brighter (it’s rated at 500 nits). It’s certainly noticeable to me. Colors are vibrant, and the details are sharp. I thought the screen quality looked good in older iMacs, and the new brighter screen hasn’t really changed my opinion. The $1,299 and $1,499 iMac comes with a 4K display (native resolution of 4096x2304 pixels) that supports the P3 color gamut and billions of colors. If you opt for the $1,099 iMac, you take a step down with the display—you get a standard 1920x1080 resolution screen that’s capable of displaying millions of colors. The wireless Magic Keyboard uses a Lightning connector to charge. Apple includes a wireless Magic Keyboard, which has a Lightning connector for charging. That means Apple includes a Lightning cable with the iMac—you can never have too many Lightning cables, especially if you have an iPhone and an iPad (and perhaps even multiples of those devices). Apple also offers a wireless Magic Keyboard with Numeric Keypad that you can opt for at the point of purchase. It adds $30 to the price of the iMac. Apple also includes a Magic Mouse 2. If you rather have a Magic Trackpad 2, it’ll cost an extra $50. You can also choose to include both a Magic Mouse 2 and Magic Trackpad 2 for $129. If you need to a non-wireless device to the iMac, you’ll find the ports on the back. 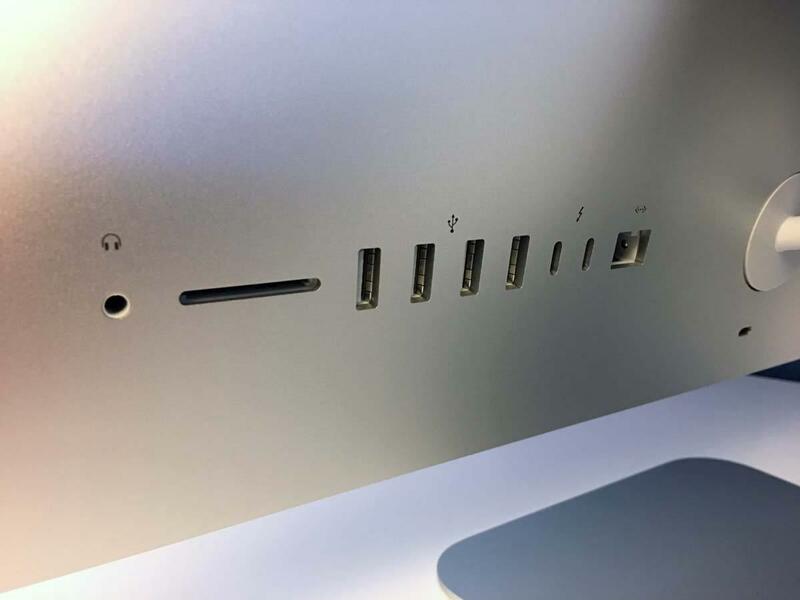 The iMac has four USB 3 ports, as well as two Thunderbolt 3 ports. 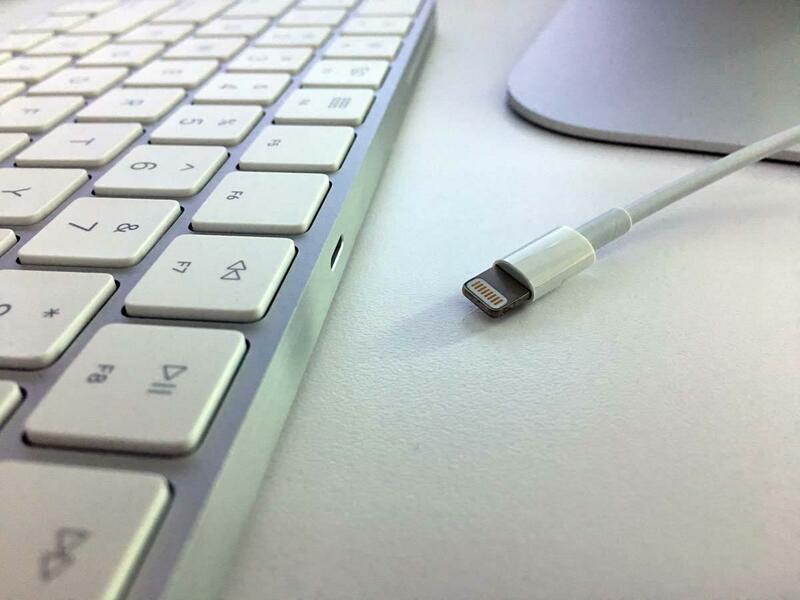 If you want to connect an external display, you can do it through Thunderbolt 3, but you’ll need an adapter. The iMac also has an ethernet jack, a SDXC card slot, and a Kensington lock slot. From left to right: audio out, SDXC card slot, four USB 3 ports, two Thunderbolt 3 ports, ethernet, Kensington lock (under the power plug). It would’ve been nice to see a bigger speed increase over its predecessor, but the $1,499 21.5-inch iMac 3.4GHz Core i5 is still a great computer, and its boost over older iMacs is much more impressive. Also, the Kaby Lake iMacs could benefit from macOS High Sierra, especially when it comes to handling HEVC video. In all, the 2017 iMac continues the excellence that we’ve come to associate with the iMac.